What if you could eat a vegan diet but still keep your curvy figure? Or possibly even gain healthy weight? Now you can! Yes! I am ready to Order my Curvy Vegan Guide! Have you been wondering how to become a vegan but afraid you will lose too much weight? Are you tired of still feeling hungry after eating a vegan meal, but don’t know how to make filling meals? Are you already eating meatless but releasing more weight than you desire? Are you stuck eating the same vegan meals, stuck in a food rut and want to shake things up? Do you need an easy, healthy weight gain meal plan to fit with your busy schedule? If so, the Vegan With Curves 28 Day Meal Plan is exactly what you need! Gaining healthy weight as a vegan is easier than you think. Vegan With Curves 28 Day Meal Plan is your step-by-step guide for learning how to eat high-calorie meatless meals in order to keep and/or gain curves. If you’ve ever wanted to gain healthy weight but still be healthy, this is the guide for you. This is the guide I wish I had when I first went on my vegan weight gain journey. √ Improve your overall health by going from the Standard American Diet to a cruelty-free lifestyle. I’m ready to Pre Order my ebook! √ My Story, of body transformation and how being a vegan help me have a positive body image. √Information on getting your plant-based protein, “curvy” carbohydrates, and healthy fats on a vegan diet. Yes I am ready! Let’s get started! On the far left I was weighing 165 pounds. (I am only 5 feet). Here I was overweight (for my height) having trouble breathing while walking up the stairs. Desserts were my number one comfort foods that and fast food (especially KFC) Here I a smiling but I was miserable mentally, spiritually, and emotionally. With the middle picture, I weighed between 98 pounds to 100 pounds. I started to clean up my diet, became a plant-based eater eating a serving of meat only 3 times a week. My mental health got so much better because of the food I was consuming and I released a lot of weight. While I was happier to be lighter at first, I began to become overly obsessed with weight loss and lost too much weight and lost my curves. The right pictures show how I look today. I am a full vegan ( I eat a 100% vegan diet). I go from 130 pounds to 140 pounds and loving my new curvy and fit figure. I feel more balanced and I have found a happy medium with both my body and mental state. This is how this website was born. I’m the owner and founder of Vegan With Curves, where I share my vegan recipes and curvy vegan tips with thousands of readers every single month. The emails and comments I get regularly from women who have enjoyed eating a vegan diet, enjoyed my recipes, and truly searching for help in sticking with this healthy lifestyle but gaining healthy weight have inspired me to write this book. I know how you feel. I was so desperate at one point that I considered giving up the lifestyle and risking my health just to get the body I desired. Trust me you don’t have to go back to your old eating habits in order to gain healthy weight. I am living proof. Along with a healthy vegan diet and good strength training program, healthy vegan weight gain is more than possible. That’s why I did all the hard work for you so you can get to change your life the second you open this guide. Yes! 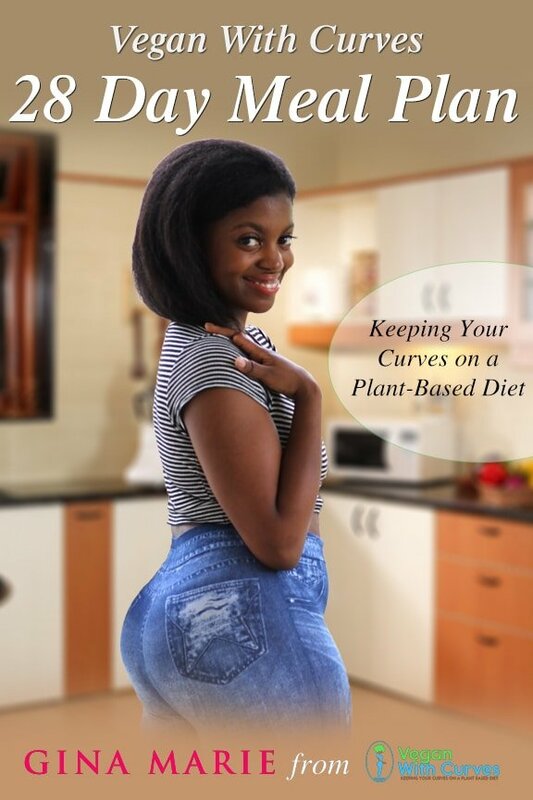 I am ready to Order My Curvy Vegan Ebook! All digital purchases made on https://veganwithcurves.com are non-refundable or exchangeable. Since the products made available here are digital and intangible, we have a strict no refund policy. Please read sales policy HERE. Will this guarantee me to get curves? Nothing is guaranteed! That is entirely based on YOU. Your consistency with the program any individual health issues plays a major role. I am sharing with you what I did and what worked for me when followed consistently. Is there a workout plan in the guide? No. This eBook is a meal plan guide only. A workout guide will be out later in the year of 2019. Yes! Just click the “pay with paypal” option in the upper right hand corner of the checkout screen. Are these easy to find ingredients? Are these recipes gluten-free and soy-free? Some are gluten-free and most are soy free but every recipe that isn’t gluten or soy free has adaptions if applicable. Are these recipes raw food and alkaline based? No. If you follow a restrictive vegan diet you may adjust it to your liking but these recipes do not cater to “oil free”, “no hybrid”, “alkaline” or “electric” or “raw food” meals. At the most some or either gluten free and/or soy free. Are desserts part of the meal plan? Do you offer a Hard Cover Version? Sorry, but Vegan With Curves 28 Day Meal Plan Guide is only available as a digital download at this time.